This cover image released by New West Records shows “Guy,” a release by Steve Earle. On his previous album, from 2017, Earle wrote a farewell to the master, “Goodbye Michelangelo,” and sang “The Last Gunfighter Ballad” on an extended 2011 Clark tribute record that also featured Willie Nelson, Emmylou Harris and Rodney Crowell, among many others. 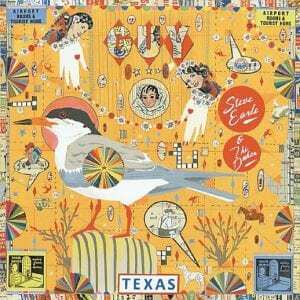 With the Grammy-winning “Townes” added to Earle’s catalog in 2009, it was only a matter of time before “Guy” came along. “When I get to the other side, I didn’t want to run into Guy having made the ‘Townes’ record and not one about him,” Earle says, and the Clark songs fit him and his weathered voice like a second skin. Earle chose nine of the 16 tunes here from Clark’s 1975 debut (“Old No. 1”) and its 1976 follow up, “Texas Cookin,’” including such classics as “Desperados Waiting for a Train,” and “L.A. Freeway,” and the performances with The Dukes add some occasional electricity to the originals but don’t stray far. The wattage gets an extra boost on “Out in the Parking Lot,” which a late-career Clark co-wrote with Darrell Scott, and the change from Clark’s more reflective reading suits it just grand. Touching closer, “Old Friends” expands the circle to include vocals from other Clark acolytes like Harris, Crowell, Terry Allen and Jerry Jeff Walker. From Johnny Cash to Lyle Lovett, Clark’s songs have been covered extensively over the years, but the Texan had a knack for recording the definitive versions himself. Still, “Guy” ensures that, whenever Earle’s next meeting with Clark may come, Earle has done well by his old friend with this heartfelt tribute and there’ll be no need for reproaches.